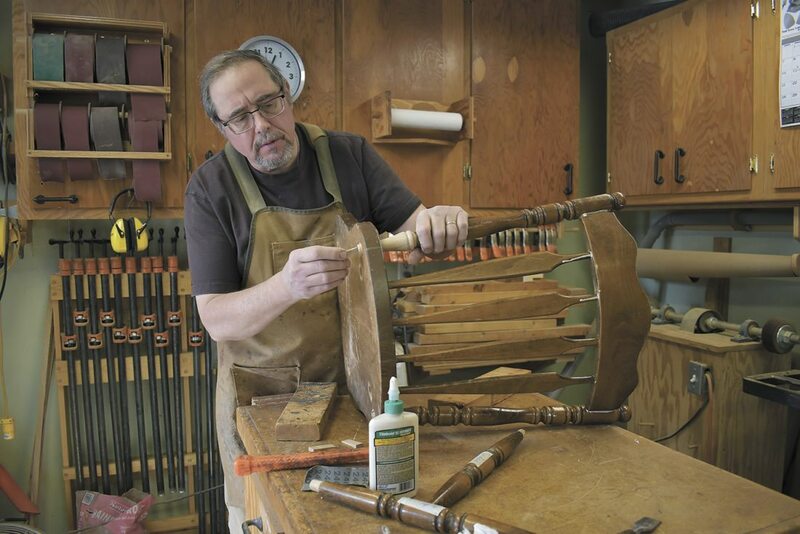 -Messenger photo by Chad Thompson Mark Hilken, of Fort Dodge, works on a chair in his shop recently. -Messenger photo by Chad Thompson Mark Hilken, of Fort Dodge, repairs a chair in his shop recently. It was 1990-something when Mark Hilken took a trip out to the Fort Dodge Regional Landfill and noticed a collection of antique chairs that had been left to rot. But instead of loading up the abandoned furniture, Hilken drove off without the pieces. Now when Hilken thinks back to those forgotten chairs, he regrets not taking them with him and restoring them. 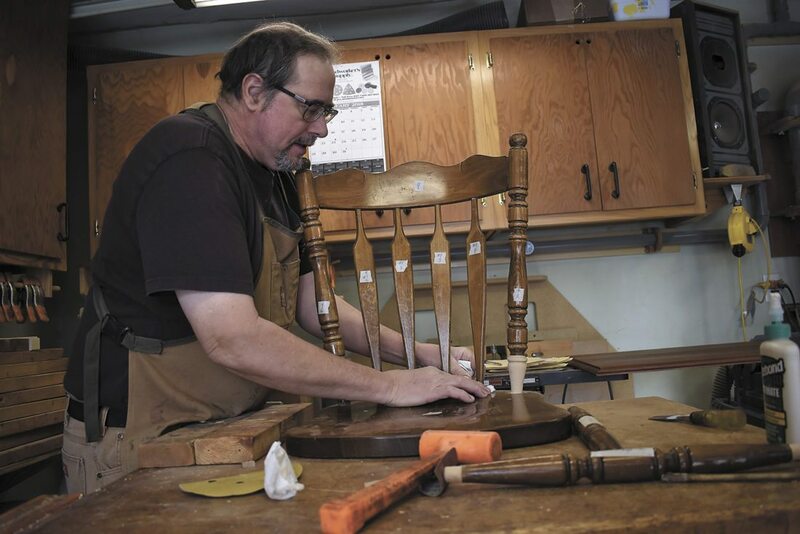 Hilken, of Fort Dodge, has been repairing antique furniture for 26 years. He said if it’s made of wood, it can be fixed. Rocking chairs, kitchen chairs, and tables, are examples of projects Hilken has taken on. When Hilken visits the landfill, he said he doesn’t usually find tables. The legs of chairs are a common repair he makes. Hilken graduated from Fort Dodge Senior High in 1974. He woodworked full-time from 1991 to 2001, before going to work at National Gypsum Co. and then Valero Energy Corp.
“I grew up a lot working for those companies,” he said. Hilken returned to full-time wood working in 2017. He makes the repairs in a single-car garage behind his Fort Dodge home. Hilken said his education in Fort Dodge schools was beneficial. “I am self-taught, but all of the basic woodworking training I got from Mr. Peterson’s wood shop at the north junior high,” he said. 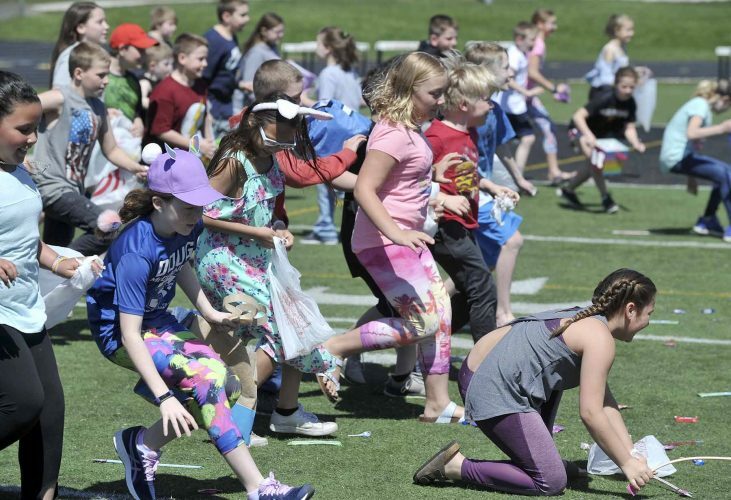 Peterson was one of Hilken’s teachers in 1970 at Phillips Middle School, he said. Hilken said Phil Hanson at Fort Dodge Senior High also helped him. Many of the pieces Hilken works with have a connection to the past. One particular item was a high chair that Hilken believes was made during Civil War times. An older couple from out of town brought it to him. The woman had sat in the chair when she was young, he said. The chairs had handles and could convert into strollers, he said. Hilken was able to successfully restore the high chair. Through his work, Hilken gets to know the people. He said some older furniture can contain more than one type of wood. Hilken has earned Iowa State Fair ribbons and awards for his woodwork. He won Best of Show in 1999 and 2000. In 2017, Hilken restored 105 pieces. He likes the challenge of bringing something back to life. He plans to continue his craft for the foreseeable future.